Last night’s demo/floor prep was mostly as expected, dusty, dirty, noisy, and without event, except when all my clothes fell on the floor during the closet “organizer” demo that took place in my closet. Then it became filled with swearing and scrambling to put together a fix — yeah, Bruce! No big whoop, just have some dusty stuff to wear (I’m sure 47 years of dust and grime will brush off and not stick) and clothes lying on the lounge sectional, in a guest room closet and in piles throughout the house. That’s ok, Guinness likes soft things to sleep on, everyone is ok, everything’s fine. I’ll probably put it all back tonight or at least put the stuff that can hang high enough to stay out of the floor dudes’ way on Saturday. While I was making dinner last night and Bruce was getting the tools and stuff ready for last night’s demo fun, the door bell rang twice. Since no one usually just drops by, even the neighbors text us first, we figured someone was selling something, which meant they were ignoring our No Soliciting sign. The Gs went insane and threw themselves against the front window when the person didn’t leave so Bruce had to investigate. It turns out it was actually a woman from the neighborhood association (kind of like a homeowner’s association, but without the annoying rules and restrictions and set up mostly for social reasons to foster community in the neighborhood). She came by to tell us that….drum roll please….we won the Yard of the Month for May! What an amazingly nice surprise, especially since the inside of the house looks so terrible at the moment! 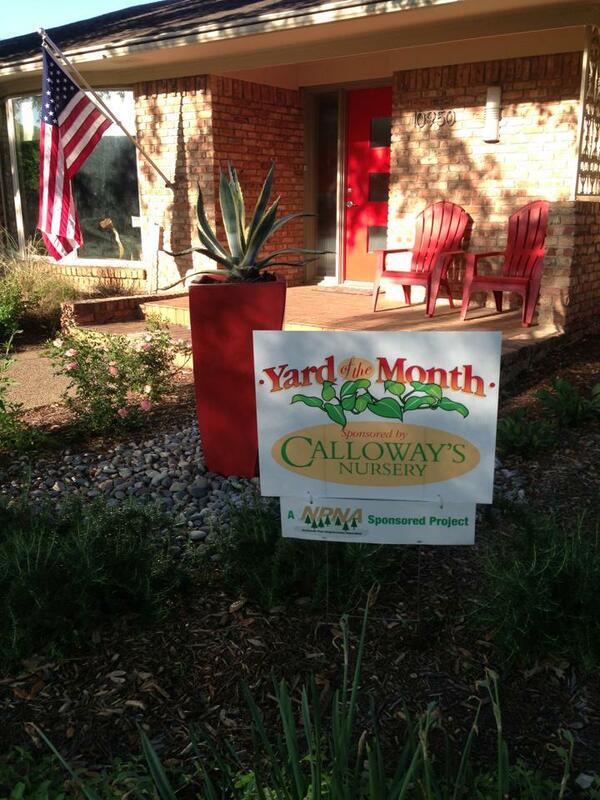 The Mortroski Midcentury has the Yard of the Month for May and the sign to prove it — thank you NPNA and Calloway’s! She’ll be back to take photos for our neighborhood e-newsletter today (light was not good for photos at 6:45 pm last night — too bright), but Bruce took a few this morning. You can see we replaced the mailbox, front door (added side lights and windows, painted it red), added a new porch light, new windows, new water-restriction friendly landscaping, removed a bunch of grass, pulled out the crumbling brick “planters” and the hollies. A lot has happened since we moved in! 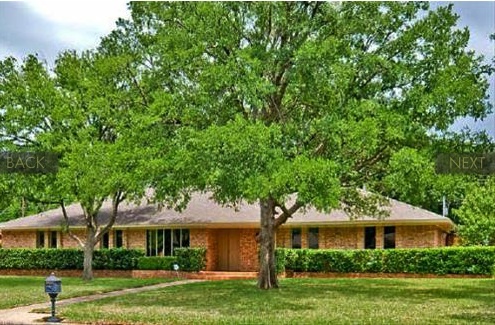 Unfortunately for our neighbors, all of the exterior changes were done over a period of about 6 months, maybe longer even longer (I’ll wait for Bruce to correct me and then update this post), so the front of the house really looked bad for a lot of that time. 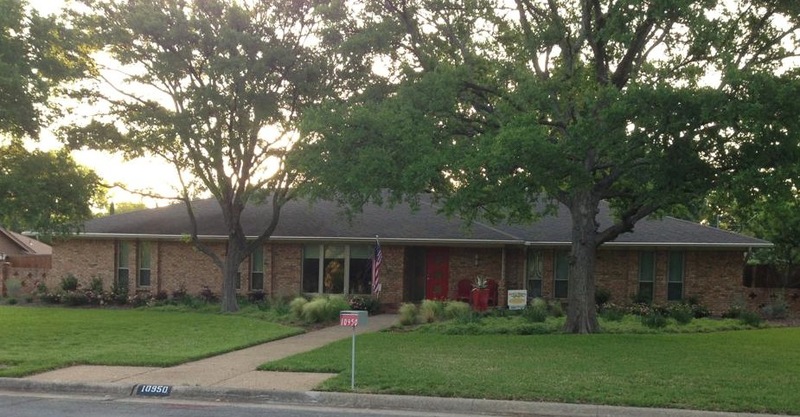 When it looked really bad, we joked that we would definitely win for the Worst Yard of the Month — I even thought about making a parody sign to acknowledge our eyesore sweet eyesore. But now the house has become a landmark of sorts for the neighborhood. We’re “that house with the red pot in front” or “the house with the red door and the red chairs on the porch.” It’s great for delivery people and people visiting for the first time. Can’t miss us now! 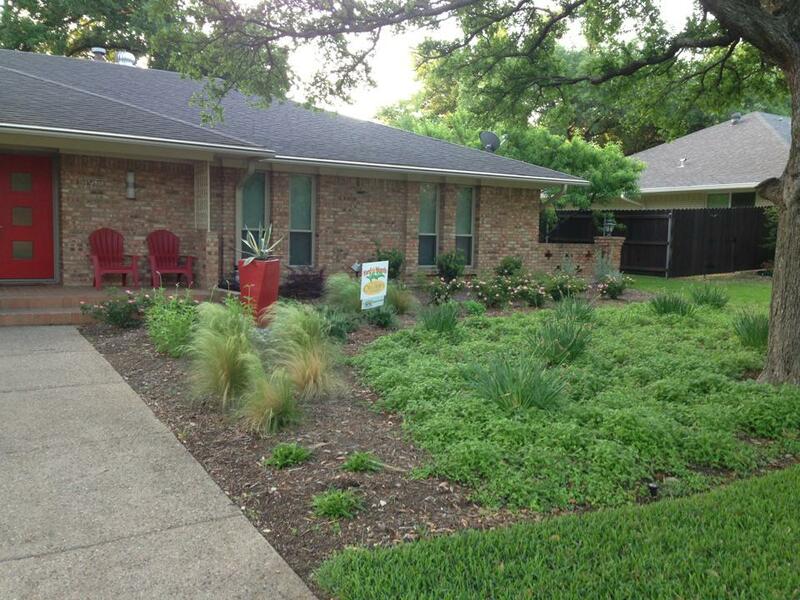 The landscaping is all native Texas perennials so stuff happens all year ’round. If you look carefully you’ll see a doggie in the window next to the flag (it’s George). Other side, more Texas perennials and that’s a striped agave in the red pot. A nod to the Great White North with the Muskoka chairs (aka Adirondack chairs) on the porch. Bruce and I pulled down the crumbling brick “planters” (really not wide enough nor deep enough for mature holly bushes with trunks 10 inches in diameter so they were busting out through the sides) one hot spring day (my main job was hauling the brick to the backyard using my garden cart where eventually we loaded into a dumpster some months later—Guinness and Godiva liked the odds of furry creatures living in the brick ruins and were sad that the bricks went away). But first we had to cut down the hollies (not as easy or as fun as you might think) the summer before getting the windows installed. They grew back despite being cut to the ground. So we had to chop them up again before the planter demo. And heavy equipment eventually had to be used to pull them out (though not by us). Once we realized that we were completely over our heads with figuring out the landscaping plan ourselves, we attended a session at North Haven Gardens on landscaping and meeting Berrit from Roundtree Landscaping last summer. We had planned to get a plan, then install everything by ourselves. 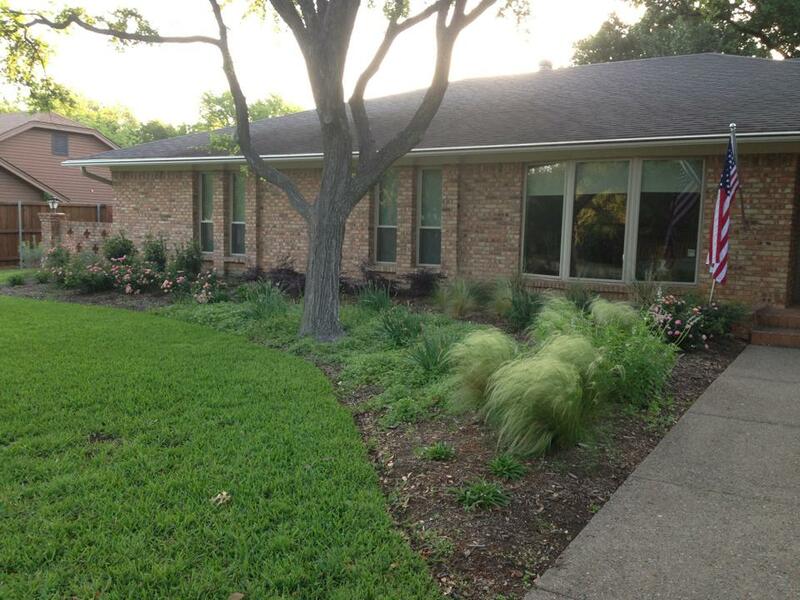 Berrit listened to our desires to have a lower impact, native landscape while minimizing the amount of grass we had to water during the hot Texas summers and drew up a plan that’s a lot like what ended up being planted. She also gently suggested that we should leave the sprinkler moving and planting to the professionals (she was right). She was fantastic to work with and we’re so glad that we worked with her. You can’t see it but in the enlarged planting beds, the Roundtree crew changed the sprinklers to drip irrigation and the sprinklers for the front grass to NP rotors, a type of sprinkler that gets more water into the ground verses spraying in the air. They planted small plants since they will just get bigger and spread as the years progress. Everything was planted in late August 2012, except for a bunch of daffodils which were planted in February 2013. The trees are a lot happier too. They’re getting watered deeper and better so we hope they’ll stay out of our plumbing (a big problem down here) from now on. It’s so nice to be recognized for the changes in the yard, but truthfully, we didn’t do it to get recognized, but to make our house look more inviting and more our style. Like everything we’ve done to the Mortroski Midcentury (with the exception of the big plumbing mess), we did it because we wanted to. We’re trying to bring back some style to the place. So far so good. PS: Guinness and I are going to the vet at 4 pm as planned. He’s still not ok and I’ve been giving him rimadyl (anti-inflammatory that he has been prescribed for his back and neck issues caused by wrestling with George and chasing Godiva) for the pain. He’s eating and drinking, wagging his tail, etc., but tried to bite Bruce when Bruce was poking around in his mouth. There’s something that hurts and it needs to get looked at. Update tomorrow. This entry was posted in Sow and tagged 3G Network, agave, bruce, Calloway's Nursery, DIY, dogs, flooring, front yard, George, Godiva, Guinness, irrigation, Julie Petroski, landscaping, Mortroski Midcentury, Muskoka chair, native Texas plants, north haven gardens, perennials, red, Roundtree Landscaping, sprinklers, Texas, water, yard, Yard of the Month. Bookmark the permalink. I’m not surprised at all. Your home looks amazing! You guys have the best sense of style!! Lol. Clearly you have forgotten the “transitional” front yard look! And the inside…don’t come by for a week or so. Thanks for the kudos. Congratulations! It’s nice when efforts are recognized. Give Guiness a hug for me. Thanks, Fransi! Poor Guinness is pretty sleepy from his meds. Hopefully he’ll feel better in the am. He’s got a abscess and fractured tooth. Slab fracture. He’ll be on antibiotics until next Tuesday and then he’s getting the tooth extracted on Tuesday. Poor buddy. This is very common in lab-ish dogs. He could have done it a long time ago and it could have been the right bacteria conditions for abscess. I did want to know what a slab fracture is. Now I know, although I passed on some of the pix. Poor Guiness! He’s going to need some extra cuddles for the next few weeks. Yeah, yuck. His tooth does not look as gross and infected as the photos, probably because we caught it quickly. But as the vet said, 9 out of 10 times labs with a tooth issue have a slab fracture in the same tooth as Guinness. He’s more interested in food today, although he never stopped eating. The vet said we may find that he eats better from now on if this was an old injury. He may have been favoring it for years. That would be a bonus for him since George is a plate cleaner–and it doesn’t matter who’s plate. Good to see you are being recognised for your hard work! Except we didn’t really do much with the front besides pay for it. And occasionally weed. As I said I’m weeding today because truthfully there are so many weeds!